Today I'm linking up with The Mommyhood Chronicles for Saturday's Top Five Laughs Blog Hop - a culmination of the week's funny/cute kid moments. 5. For the past few weeks, C has been able to point out where his nose is when asked. Yesterday, however, he came up to me and touched his nose (unprompted) and said "no" (how he says nose). I thought that was cute - then he touched my nose and said, "Mama. No." While I'm not counting that as a two word "sentence" - it definitely melted my heart. 4. This week we realized that the kitchen towels on the oven handle aren't safe from the C monster. He pulls them down and puts them on his head like a baby babushka. 3. Yesterday, I pulled some toys into the bathroom and hoped C would occupy himself while I took the fastest shower ever. Instead, he spent the whole time playing peek-a-boo with the shower curtain. Cute. Slightly awkward, but cute. 2. Mama was C's first word. Apparently he's gotten it all out of his system. This is the conversation we had the other night. "Say Mama!" "Dada." "Mama." "Dada." "Ma." "Da." He thinks he's just hysterical. 1. We're trying to teach C to color without putting the crayons in his mouth. 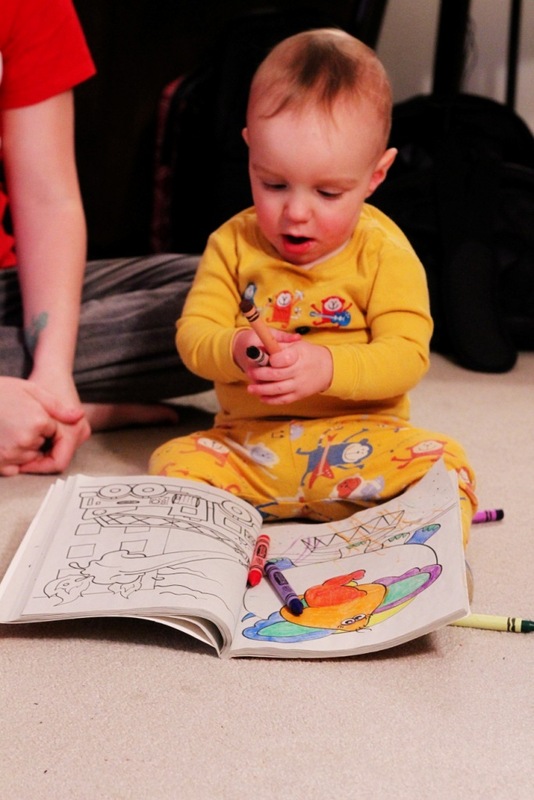 Thursday night, we were sitting on the floor coloring and anytime I'd look away, he'd slowly move a crayon to his mouth - with his eyes on me the whole time. When I'd look at him, he'd pull it away. Little stinker. How cute with no and nose! I know what you mean nothing is safe. Kids will take anything in a blink of a second. So cute with the peak a boo! Too cute with the crayons. His little game! Loved reading your laughs!! Haha, C is so cute!! Your laughs are so cute! Love that he can point and say nose, very smart! I am a new follower from Sat. Top 5! he is smarter than you think mama!! I found you on the blog hop - love your blog, and as a mama to kids aged 9, 7, and 9 months, I'm enjoying the preview of all the upcoming milestones for the littlest one that I've forgotten about from the first two times around! I started following and I'm looking forward to reading more - please consider following back! L totally does the kitchen towel thing, too. And the peek-a-boo shower curtain game. Say Mama but he yells Dada -- that's a favorite game in our house too! :) Little boys are so much fun at this age! Can't wait to read more!